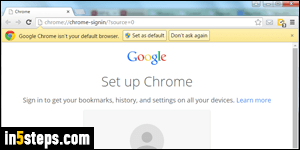 By default, Google Chrome launches with a single tab, regardless of the sites you had opened during your last browsing session. But it includes a setting that automatically restores all the tabs since you last closed the browser (a very useful option if you accidentally exited Chrome in the middle of something!) You can also make Chrome automatically load specific sites when it launches. Tip: Ctrl+Shift+T (Windows) / Cmd+Shift+T (Mac) reopens the last closed tab. Click on the Chrome menu button (top right corner, see previous screenshot), and choose "Settings". Under "On startup", select the "Continue where you left off" option. Notice that the third option, "Open a specific page or set of pages", lets you automatically open the same group of tabs when Chrome launches (same thing as multiple-homepage support in IE or Firefox). Close the Settings tab: your change was saved, and takes effect immediately. If, for some reason, Chrome didn't automatically reopen all the tabs from your last session, you can hit Ctrl+H / Cmd+H to view your recent browsing history. 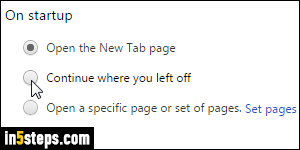 Click on any item to restore that particular site / web page in a new tab. 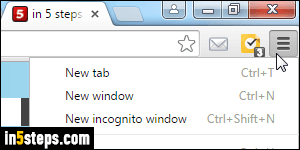 Like normal links, middle-click or Ctrl-click / Cmd-click on a browsing history entry to open it in a background tab. Shift-clicking opens it in a new window! Another awesome feature, discovered the hard way: after a Chrome crash, you can recover and force-restore your last session's tabs by hitting Ctrl+Shift+T / Cmd+Shift+T, the same keyboard shortcut that reopens the last tab. This even re-opens separate Chrome windows opened during the last session. Tech Tip: you can also restore the last closed tabs by launching Chrome from the command line with the "-restore-last-session" argument / parameter / switch. 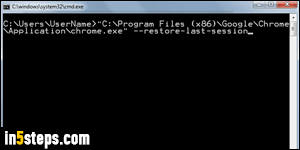 The path to Chrome, depending on how recently you added it, is either in your application data folder, or the "Program Files (x86) > Google > Chrome > Application > chrome.exe" folder. 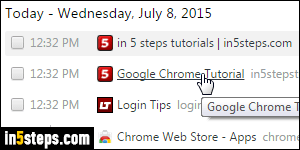 To always restore the last tabs, add that argument to the properties of the shortcut you use launch Chrome.